New tests show almost all of the fuel inside one of the Fukushima plant's reactors has melted, its operator said Thursday, the latest step in the clean up after Japan's worst ever nuclear crisis.Tokyo Electric Power Co. said the technology, which uses elementary particles called "muon" to create x-ray style images, gave the most concrete evidence yet the fuel had dropped to the bottom of the first reactor.The data, though largely expected, should help TEPCO as it continues its effort to decommission the plant four years after an earthquake and tsunami caused one of the worst nuclear meltdowns in living memory.Engineers have not been able to develop a machine to directly see the exact location of the molten fuel, hampered by extremely high levels of radiation in and around the reactors. 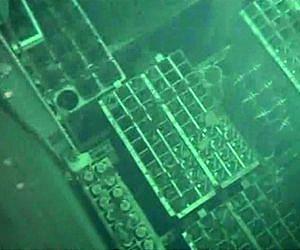 "While our previous analysis have already strongly suggested that fuel rods had melted down, the latest study provided further data that we like to regard as a progress in our effort to determine the exact locations of the debris," said a TEPCO spokesman.TEPCO plans to eventually use robots to locate the fuel debris as part of the decommissioning process, which is expected to take three to four decades to complete.Last month the International Atomic Energy Agency said Japan had made "significant progress" in its cleanup efforts but warned the situation "remains very complex" due to the growing amounts of contaminated water generated by the process.The Fukushima Daiichi nuclear plant was directly hit by the 9.0-magnitude earthquake and killer tsunami of March 2011.It lost emergency power to cool the reactors, which went into meltdown, contaminating a vast region in northern Japan. TEPCO plans to eventually use robots to locate the fuel debris as part of the decommissioning process, which is expected to take three to four decades to complete. Last month the International Atomic Energy Agency said Japan had made "significant progress" in its clean up efforts but warned the situation "remains very complex" due to the growing amounts of contaminated water generated by the process.The Fukushima Daiichi nuclear plant was directly hit by the 9.0-magnitude earthquake and killer tsunami of March 2011.It lost emergency power to cool the reactors, which went into meltdown, contaminating a vast region in northern Japan.